Wrexham Glyndwr University has completed its £11m acquisition of Wrexham Student Village. The acquisition means that Wrexham Glyndwr University now own the 323 en suite bedroom complex and the land adjacent to the building, next to the football stadium. Nine Wrexham Village staff have also transferred to employment within Wrexham Glyndwr University. Director of Operations, Lynda Powell said: “This acquisition is part of our Campus 2025 strategy to improve and enhance our campuses for current and future students. “One of the planning applications we have just submitted as part of our Campus 2025 strategy is to seek outline planning permission to build a further 200 bedrooms in the future. 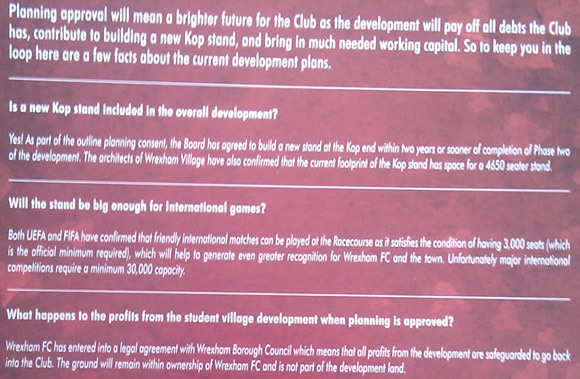 Previously the University have announced multi million pound plans to rennovate and rebuild vast areas of their estate, and at the time we asked if the ‘Kop’ land would be included in any purchases – and was told yes. The announcement by the University sees the end of a protracted involvement in the area by former football club custodians Geoff Moss and Ian Roberts. Regular Wrexham.com readers will be familiar with the well documented issues relating to Wrexham Village over the years, with one of our articles explaining the background to an eventual non-answer from Wrexham Council to four straightforward questions. The student flats have been seen as controversial for Wrexham football club fans, as they were clearly told all profits were due to go into the club, but they were since told the club will ‘not see a penny more’ and has had all it will have ‘upfront’. The above leaflet was handed out to fans prior to the development starting, with then manager and ‘star‘ name Dean Saunders helping dazzle local councillors into taking a planning ‘gamble‘ via his odd attendance at a council meeting. Fans have protested noting that they feel there is a moral obligation to see some of the proceeds of the multi million pound sale be returned to the football club, creating a hashtag of ‘#WheresOurShare?’ referring to ‘unkept promises’. The new era of ownership appears brighter with the new landlords now owning both the flats and the Racecourse ground, with rumoured development due on Crispin Lane towards Mold Road as well, by stakeholders hopefully more interested in the long term prospects of the area rather than a property deal. 2011 Conference Board Asks Wrexham FC For £250,000. Top picture: The long term mess left by the previous owners of Wrexham Village.